The Sisters live under the Benedictine Rule with the worship of God in the liturgy as their primary work. The Convent stands in twenty seven acres amidst arable farmland. 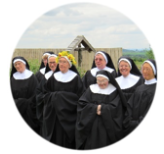 This provides the space in which the Sisters can share the atmosphere and silence of their Benedictine life by offering a ministry of hospitality to the many people who visit for Retreats and Quiet Days or to live alongside. The care of the land through conservation management is a major concern and ensures a good bio-diversity and flourishing of wildlife. A kitchen garden provides vegetables and soft fruit for our table, woodland, and several acres of rough grassland are places to walk or sit to see the wildlife or to enjoy the wide views over the surrounding countryside. 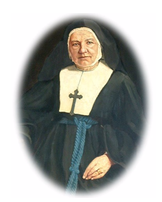 The Community of the Holy Cross was founded in 1857 by Elizabeth Neale, sister of John Mason Neale, the hymnographer, at the invitation of Father Charles Fuge Lowder. The foundation was for mission work in Father Lowder’s parish of London Docks, and mission work continued in a number of small houses up to the 1930’s. Later generations felt that the Community was being called to a life of greater withdrawal and Retreat work was developed. At about this time the Sisters began to live under the Benedictine Rule and about mid-way through the century the Benedictine Office was adopted. In 1886 a Mother House had been built for the Community in Sussex and in 1978 the Sisters moved to Nottinghamshire in the East Midlands. The Chapel is the centre of the Community, where the liturgy of the Divine Office is said or sung, and where the centre of Christian worship, the Eucharist, is celebrated daily. The Sisters have a seven-fold Office comprising the traditional hours of Matins, Lauds, Terce, Sext, None, Vespers and Compline. The greater part of the Community’s liturgy is in English but some Latin is still sung at Vespers, particularly for the greater Feast Days. Visitors are welcome to join the Sisters for the Eucharist and the Offices as they wish.